I lost the count of videos I watched over youtube to nail this recipe. I always had this feeling that something lacked in my home style recipe over the one they serve in Restaurants. I've never been a big fan of Paneer but still sometimes I give in. Coming back to the videos I was talking about, they are so many recipes with quite elaborate or very fancy method of preparation. 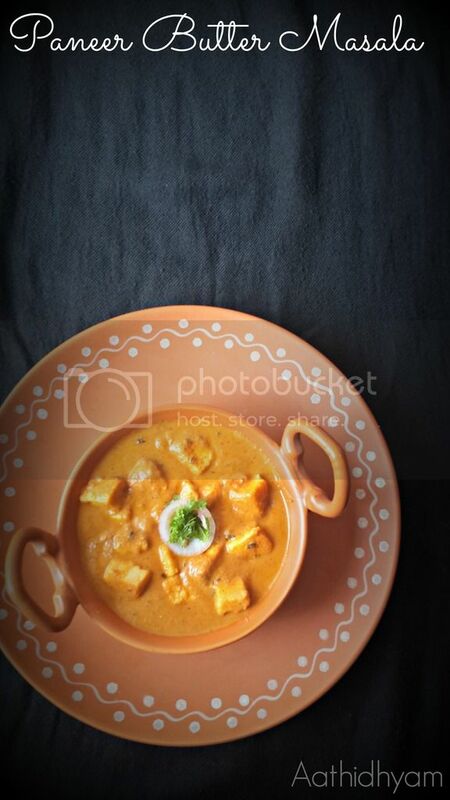 I believe that for perfect Paneer Butter Masala recipe the texture needs to be right and then followed by the color and creaminess. I combined 3-4 recipes and came up with this adapted version and Viola, I am right there. 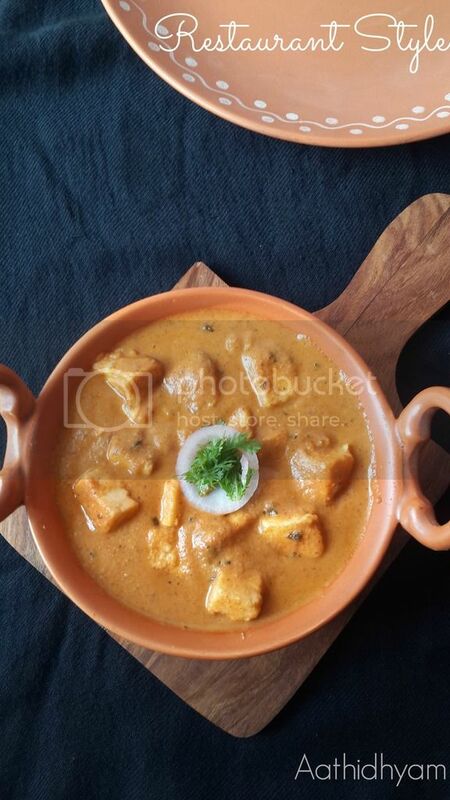 Well, I am not bragging but Mr.P who is a big time foodie told(read complimented) that this is the best paneer butter masala he had until now. This is a no fail recipe and my keeper as well. I made this like 4 times before posting this here and it always tasted good. I had to nudge myself to type this up for a sweet lady(Smita - Ms.S) whom I got to know in the recent times. Albeit we've met virtually but I have a feeling that I have known her from quite long and that we've established that bonding between us. So this post is dedicated to her. Garlic - 6-7 pods peeled. Kasuri Methi - 1 big pinch. 1) Heat oil in a kadai and add 1/2 tsp of jeera. Let them sizzle. Now add whole garam masala - cloves, cardamom and cinnamon stick. Fry for 1 min or until fragrant. 2) Now add garlic cloves and fry until they are slightly golden brown in color. 3)I prefer to grate ginger while this entire mixture is slightly turning turning. It gives a very nice aroma and takes the dish to a new level altogether. 4)Add onions and fry until translucent or soft. 5)Now add tomatoes and cook them until soft. 6) Take this mixture off flame and allow it to cool. Add cashews to this mixture and then grind this mixture into a smooth puree by adding 1/4th cup of water. 7) In the same kadai, melt butter and add another 1/2 tsp jeera and bayleaf. Fry this for a minute and add tomato +onion paste. 8) Cook this mixture until oil leaves the sides of kadai. Add salt,chilly powder and garam masala. Give a quick mix. 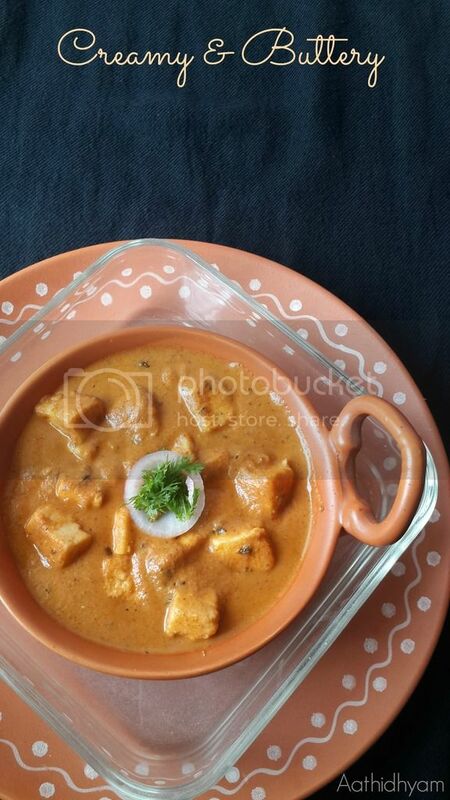 9) Did we forget about Paneer all this while? Oh yes! if you are using frozen paneer bring it to room temperature till use. I have a short cut method here, if your paneer is frozen put it in some water and heat this mixture up. Allow it to come to a boil and take it off the flame. 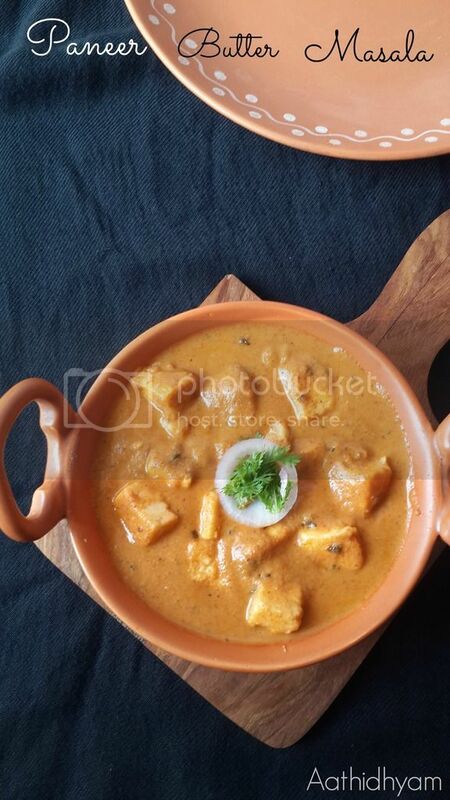 Keep paneer immersed in hot water until use. 10) If using tomato ketchup, you can add it to the gravy. Crush kasuri methi with your palms and add it. Add fresh cream. 11) If you think, the gravy is too thick you can add 1/2 cup of water. Adjust salt if required. 11) Add Paneer and allow this mixture to cook for just a minute. Serve hot with roti or plain basmati rice or Jeera rice. If you are using local or desi tomatoes, then exclude tomato ketchup. If you use both you may end up getting tangy curry. I used hybrid or Bangalore tomatoes, so for slight tangy taste I added tomato ketchup. Kashmiri red chilly powder gives nice color to the gravy. You can even use normal red chilly powder instead. Taste the curry after you add red chilly powder to the gravy. If you feel that the flavor of cloves, cinnamon stick very evident then don't add garam masala. Dish can be slightly over hyped with too many flavors if the flavor is evident. If the gravy is boiling - before even you add cream. Then add 1/2 cup of water and give a mix. Then add fresh cream. If you are adding cream when the gravy is rolling boil, your cream will curdle. So reduce the heat, add water and then add cream. 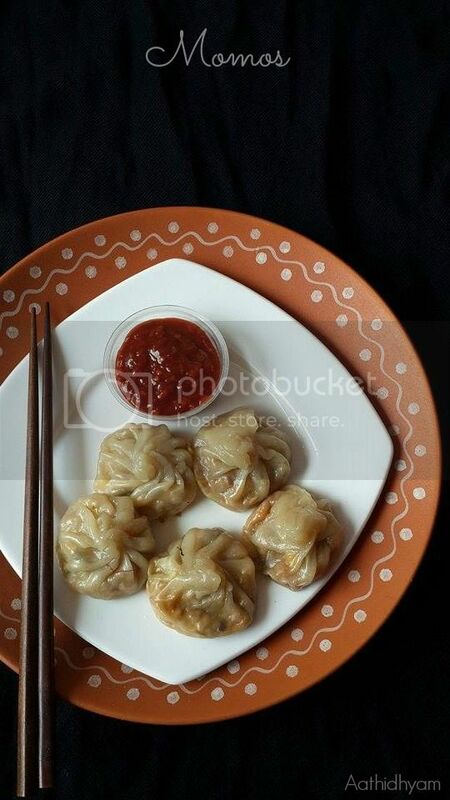 I am sure regular readers of my blog know that I love Momos. 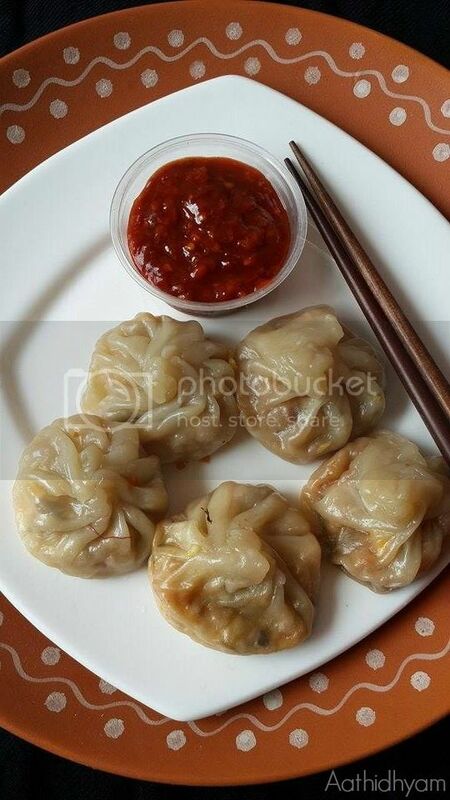 Momos in any form, shape and with any stuffing (Veg) gets a yes please from me. 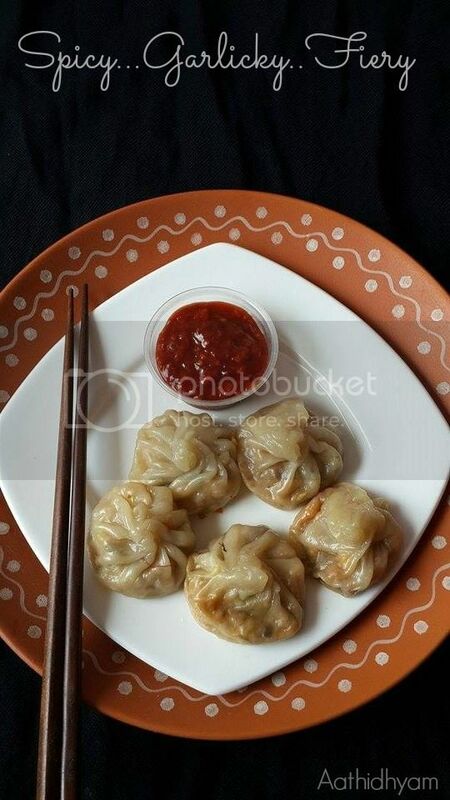 All of a sudden or may be just to get rid of those monday blues, I decided that i am gonna make Momos for lunch. I thought I am gonna wake up early that morning, but as usual I ended up getting at 10 AM. I realized that I do not even have the basic stuff like carrots, beans. I was turning frantic and I am sure that I am gonna mess up my day routine. I rushed to the local vegetable vendor and I was really lucky to get the right stuff. I was a happy camper. I kneaded the dough and threw all my veggies in my chopper and it did a fabulous job of fine chopping :) and let the pics do the talking. Knead a soft and pliable dough using Maida, sugar, salt, oil and water as required. Cover it with a wet cloth until use. Heat oil in a pan and fry garlic until golden brown in color. It's time for all the sauces and spice powders. Add them all and give this mixture a good stir. Fry this mixture for 2 mins and then you are done with the stuffing. Allow this mixture to cool. Divide the dough into 2 equal parts. Now you will get 2 logs. Cut these logs equal slices or you can actually make small balls (gooseberry sized). While you work on the first log, you can cover the second one with a moist cloth. Roll each ball or slice into 2-3 inch diameter disc. Make sure it is thin and even disc. Add a spoonful of stuffing in the center and start pleating. You will need to grab the ends of the disc and start pleating. Once done, join these pleats in the center and then twist gently towards one side. You can refer to this video for details. If your electric cooker is steamer compatible, then your life is much easier else you can use steaming basket (boil some hot water in a large pan and place the steaming basket over it) - Please refer to notes. 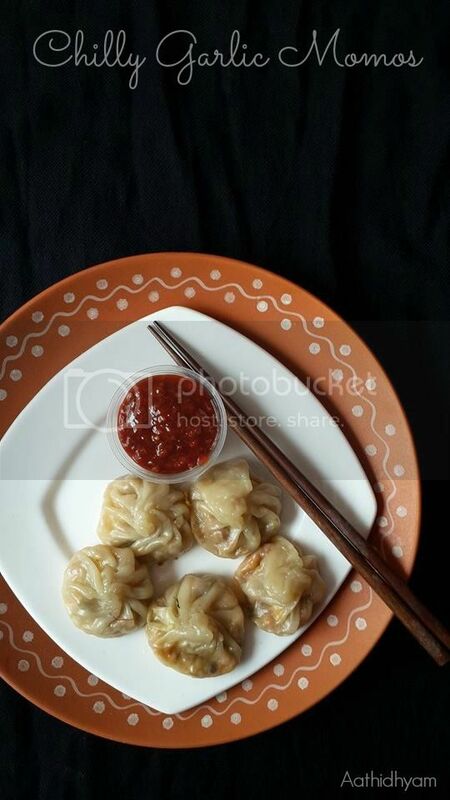 You can use idli cooker or pressure cooker and place momos on idly plates. I used electric cooker and steamed them for 7-8 mins. The outer covering will become glossy and that's when you can call it done. Procedure - Boil dry red chillies in hot water (say 1 cup) and allow them to cool. Now grind them into a fine paste using the same water. Heat oil in a pan and fry garlic and ginger until the pungent smell subsides. Now add dry red chillies paste. Cook this mixture until oil leaves sides of the pan. Add the remaining ingredients and allow this mixture to bubble up. That is it. You're done.